CAT YOGA! It’s a thing! Our hometown of Portland, Oregon is known for it’s special tendency to do things in a unique way…so it only seemed natural that our cat-loving friends Kristen and Sergio opened Purrington’s Cat Lounge earlier this year, an oasis for cats in our city – inspired by the cat lounges that are popular in Japan. Purrington’s has a constantly rotating cast of adoptable kitties that are temporary residents in the cozy lounge where cat lover’s can come and chill and have a tea or glass of wine and socialize with the resident cats in the lounge…or for those who are feeling frisky or want to use cats as an excuse to try yoga, there is PURR-YOGA!! This gentle and restorative yoga class is currently offered once a week on Wednesday nights at 6:30pm and runs about 45 minutes to an hour long with an added 30 minutes of bonus chill time to have a cup of tea or glass of wine with the cats post-yoga. 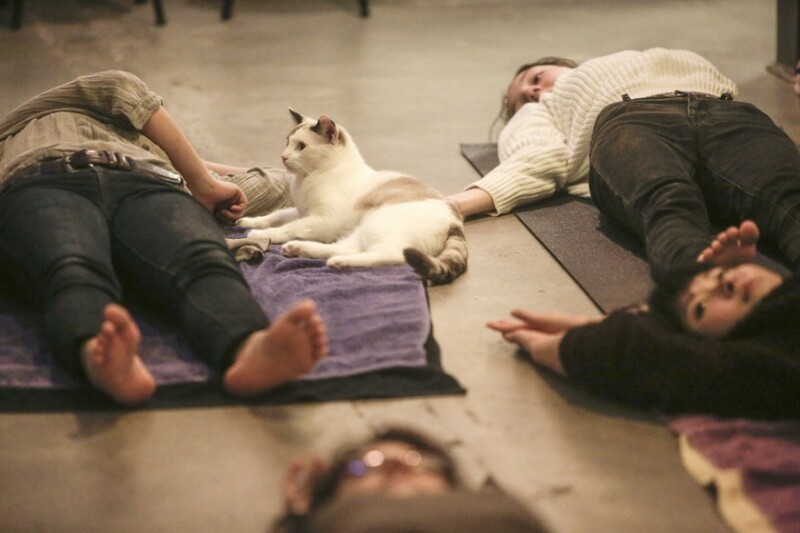 If you’re interested in registering for PURR-YOGA click here and reserve a space online. Space is limited, drop-ins are first come first serve. Don’t forget to wear comfortable clothing you can move around in, bring a yoga mat and any props you might like to use for the yoga! THE BENEFITS OF GUSBANDRY: GAY OR NOT GAY?!! The Benefits of Gusbandry dropped it’s second episode yesterday online and the plot begins to thicken quite a bit! I really enjoyed the first episode which I was lucky enough to catch at the Portland Film Festival in September and I’ve been waiting for the second to really kickstart the whole “gusband” thing into gear. A “gusband” fyi is a gay husband but you won’t find much in the way of romance in the second episode, at least involving the main character Jackie. It’s no secret that she’s clearly crushed out on the wrong dude. Ps, be sure and subscribe here to view upcoming episodes!! >Hollywood Babylon 4512 NE Sandy Boulevard – DUH! the best place to score a sweet vintage gift for yourself, or anyone on your list. we just returned from a shopping vacation in AZ and the store is stocked with some great new and cozy items. as always, our prices can’t be beat! 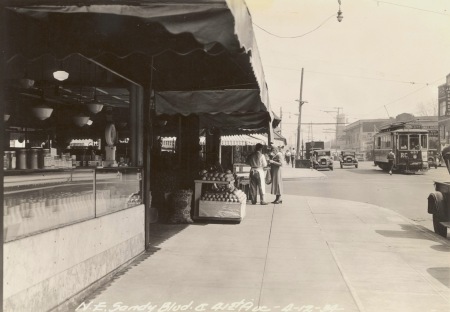 >Antique Alley 2000 NE 42nd Avenue – okay this is possibly one of the main draws to the hollywood district besides the theater and hollywood shoe repair – this enormous basement level antique mall has it all – great tchochkes, furniture, records, jewelry and more…allow plenty of time to take it all in. >Cosmic Monkey Comics! 5335 NE Sandy Blvd – the coolest independent comic book store around period. they have gift certificates. >Case Study Coffee 5347 NE Sandy Blvd – next door to cosmic monkey comics!, case study is the neighborhood artisanal coffee house…it’s next level good. hit them up to charge/recharge before/after shopping in hollywood. >Lorena’s Mexican Restaurant 4160 NE Sandy Boulevard – next to the Hollywood Theater, finally! decent family mexican food (a rarity in the Pacific Northwest). and margaritas! >Killer Burger 4644 NE Sandy Blvd – the best burger in the hood – i think it’s all about the bacon. they have crazy hour from 2 – 5pm monday through thursday $4.50 for a burger and fries. >Hollywood Shoe Repair 4504 NE Sandy Blvd (open weekdays) we are blessed to be right next door to one of the most talented (and fast and affordable) cobblers ever known. he gets so much traffic, and we’re grateful for the overflow visiting us at hollywood babylon! alright so i’m sure i missed some amazing hollywood gems – but that was a short list, so get to it! hollywood babylon was stoked to style corin tucker band’s new video “neskowin” and work with director alicia j. rose et al. it was an absolute dream to work on a project inspired be the late seventies-early eighties with such an enthusiastic director and such an agreeable cast and crew. 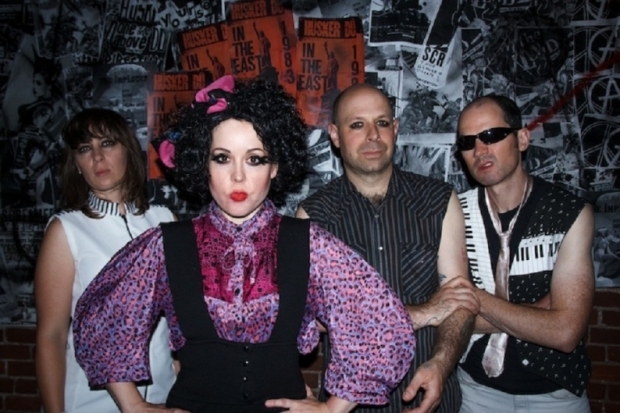 alicia gave us the theme of the video referencing poly styrene from the x-ray spex, foxes, little darlings, and we threw in many of our personal first hand memories from our punk-rock youth. back in the a day there was a DIY sensability which we wanted to capture in the styling. we especially enjoyed dressing the kids for the arcade scene ala goonies! it’s really a mash-up of seventies and eighties fashion! we loved raiding our shop for all the pieces and it’s fun to see it all immortalized. the video launched a couple weeks ago on npr and spin and others, if you haven’t seen it you’re in for a treat! to see some of our inspiration for the shoot go here!